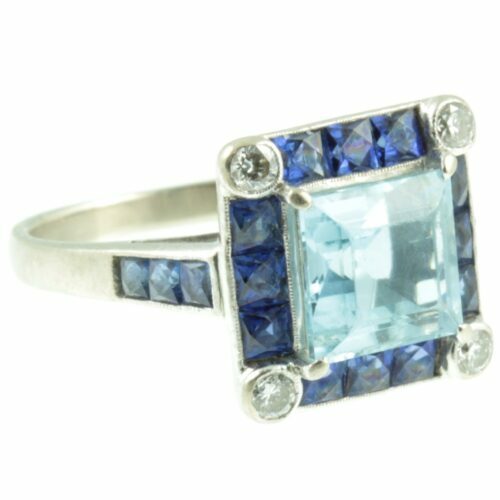 An exquisite aquamarine and sapphire ring. 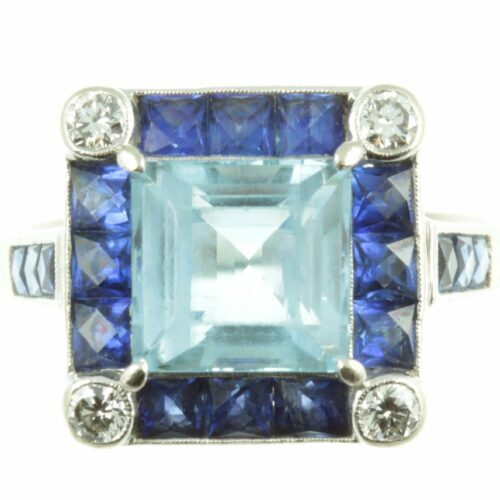 The main gemstone is a 1.50ct princess cut aquamarine. Surrounding the main stone is four rows of princess cut sapphires, which are framed at each corner by round cut diamonds in a bezel setting. The tiering of complementary blues within the ring create a stunning effect. The band is made from 18ct white gold and features a row of three sapphires on each shoulder. This distinctive ring has a timeless quality. Aquamarine weight: 1.50ct. Total Sapphire weight: 1ct. Total Diamond weight: 20 points. Ring size: UK size K, US size 5.25, top section: 12mm x 12mm, weight 4.2g, This ring can be re-sized free of charge, upon request. Period: Modern Jewellery ( 1960`s onwards ). 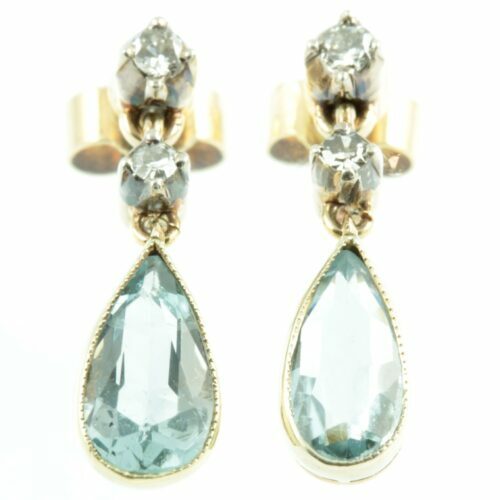 Two flawless aquamarine and diamond Edwardian earrings. These faceted pear cut aquamarine gemstones have amazing clarity and depth of colour, with a combined weight of 1.78ct. They are set in luxurious 18ct yellow gold, featuring milgrain detailing on the edge of each setting which adds extra sparkle to these beautiful antique gemstones. Which the Greeks and Romans believed to be the sailor`s gemstone, ensuring safe passage across stormy seas. 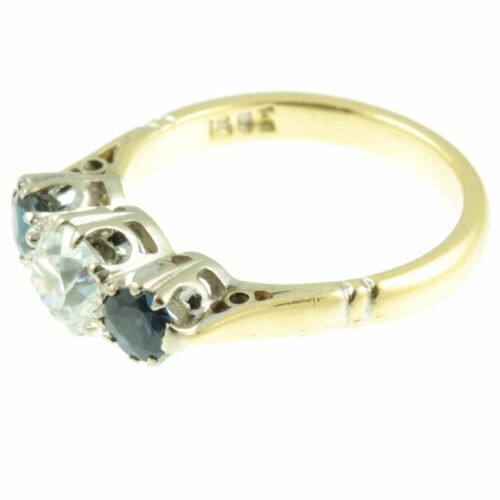 Set above each aquamarine are two round cut diamonds, which have a combined weight of 30 points. 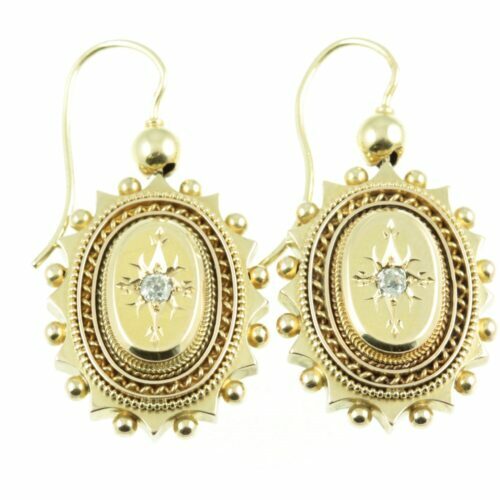 These earrings showcase the very finest in Edwardian craftsmanship, while being of timeless design. Encapsulating perfection and sophistication. Earring size: 20mm x 6mm, weight: 1.3g. Period : Edwardian Jewellery ( 1901 – 1914 ). 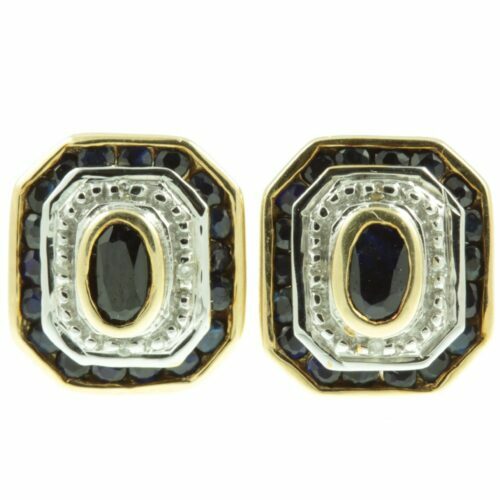 A pair of decorative Victorian gold and diamond earrings. 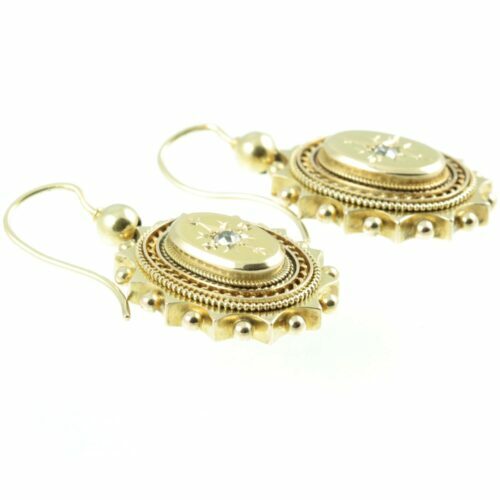 These beautiful drop earrings are made from rich 15ct gold and feature a diamond on a raised plinth. Each round cut diamond is secured by a claw setting and is accentuated by elaborate carvings. The combined weight of both diamonds is 34 points. Surrounding each raised plinth is a border of four gold ropes and finished with a recessed beaded edge. A beautiful example of intricate Victorian jewellery, as well as being of timeless design. Size: 35mm x 18mm, weight: 4.3g each. Period: Victorian Jewellery ( 1837 – 1901 ). 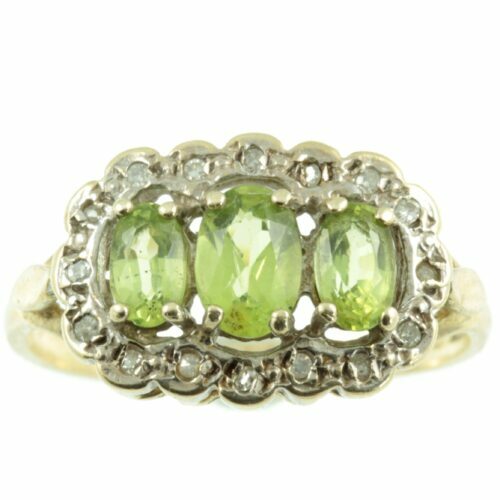 An opulent Victorian peridot and diamond ring. Three oval cut peridot gemstones weighing a total of 1ct, mounted in a 9ct white gold claw setting. 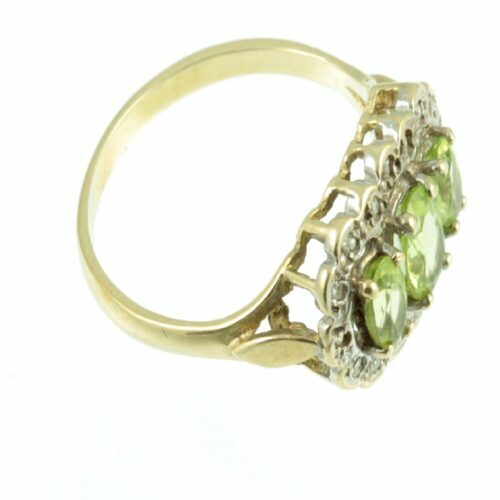 Peridot the birthstone for August, it was believed to instil confidence in the wearers own abilities. These beautiful antique gemstones are surrounded by single cut diamonds with a combined weight of 16 points. Like the claw settings, the diamonds are set in 9ct white gold. While the band is made from rich 9ct yellow gold. An exquisite piece of jewellery that deserves to be treasured. Ring size: UK: N, US: 6.75, top section: 16mm x 11mm, weight: 2.6g. This ring can be re-sized free of charge, upon request. Period: Victorian Jewellery ( 1837 – 1901 ). A striking Art Deco Egyptian pendant. 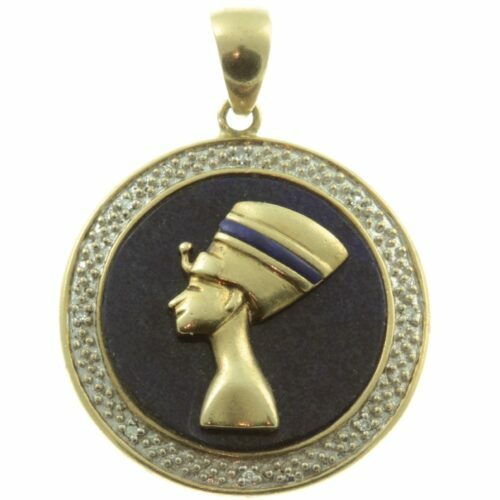 This skillfully carved Egyptian Pharaoh, with a light blue lapis lazuli headband is mounted on a dark blue lapis lazuli disc. The disc, in turn, is mounted in rich 9ct yellow gold with a surround of diamond accent 9ct white gold. The combined weight of these pave diamonds is 8 points. A beautifully hand-crafted pendant, which is eye-catching when worn. Size: 26mm in diameter, weight: 5g. Period: Art Deco Jewellery ( 1920 – 1935 ). All items are presented in one of our beautiful signature boxes, with complementary delivery worldwide on all orders. 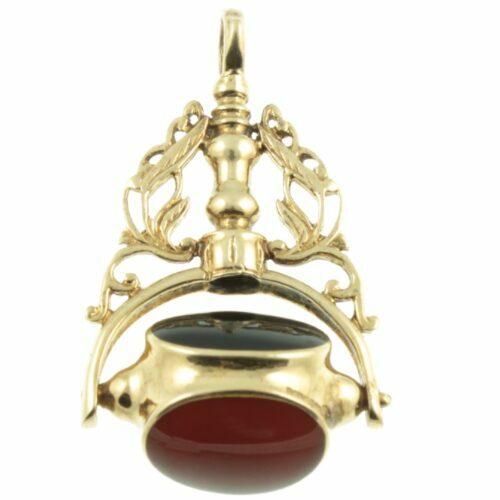 An elaborate Victorian fob pendant. Containing three oval-cut gemstones, a carnelian, an onyx and a malachite, which are set in 9ct yellow gold. 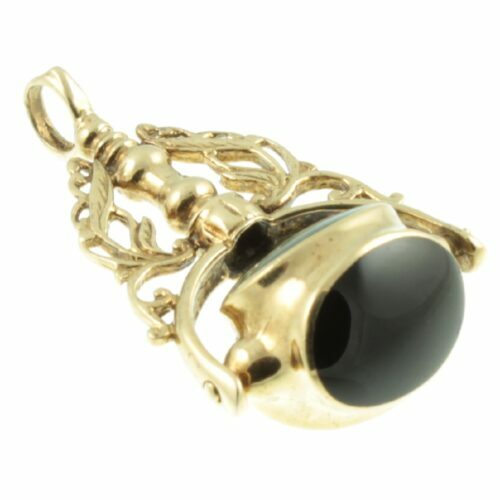 These highly polished gemstones form a triple side swivelling fob. Which is pivoted beneath an arch and a central column, with decorative floral motifs to each shoulder. A precisely crafted piece of antique jewellery. Size: 37mm x 22mm, weight: 8g. Period: Victorian Jewellery ( 1837 – 1901 ). All items are presented in one of our beautiful signature boxes, with complementary delivery worldwide on all orders. 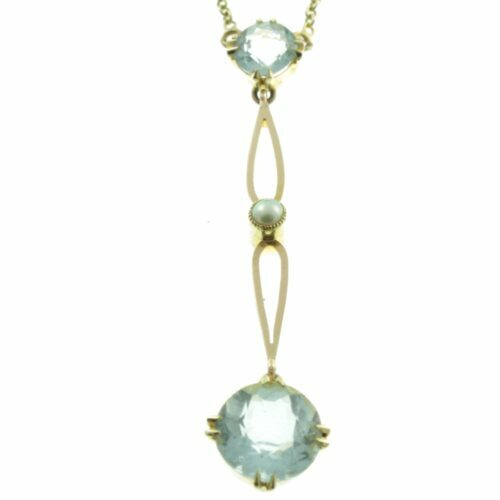 An impeccable Art Deco aquamarine pendant necklace. Two round brilliant cut aquamarine gemstones with flawless clarity and a gorgeous blueish green colour, are set in rich 15ct yellow gold using a secure claw setting. These gemstones change in colour as they are moved around in the light from pale blue to turquoise. 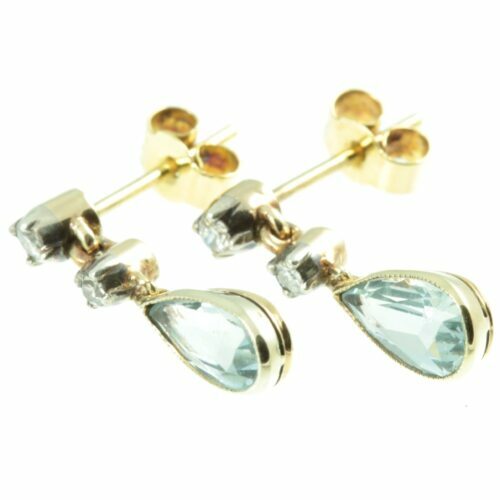 Each aquamarine has an open back setting and is attached to a bifurcated 15ct yellow gold bar. At the center of the bifurcated bar is a solid cylindrical column finished with a split seed pearl. Surrounding this split seed pearl is a milgrain border, which adds that extra sparkle to the seed pearl. This beautiful and elegant design is iconic of the Art Deco period. Perfection and sophistication captured. Total aquamarine weight: 2.53ct. Pendant size : 40mm x 9mm, chain length : 40cm, weight 3.5g. Period: Art Deco Jewellery ( 1920 – 1935 ). All items are presented in one of our beautiful signature boxes, with complementary delivery on all orders. 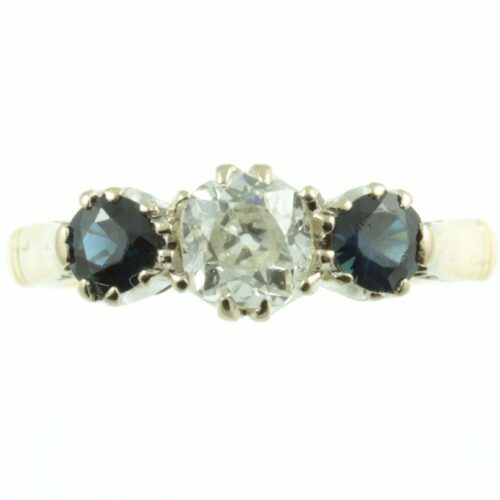 A striking diamond & sapphire ring. A round brilliant cut diamond with excellent clarity and measuring 50 points is set between two evenly matched sapphires. The sapphires have a combined weight of 63 points. All three stones have exceptional clarity and sparkle beautifully as they catch the light. Each of the gemstones is set in luxurious 18ct white gold by means of a very secure double claw setting. While the band is made from rich 18ct yellow gold which produces a beautiful contrast. Simply unrivalled beauty. Ring size: UK size J, US size 4.75, width 6 mm, weight 3.8g, this ring can be re-sized free of charge, upon request. Period: Retro Jewellery (the 1940s ). 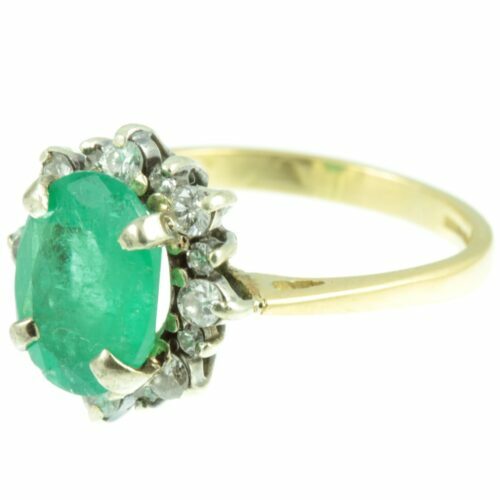 A fine Art deco emerald & diamond ring. 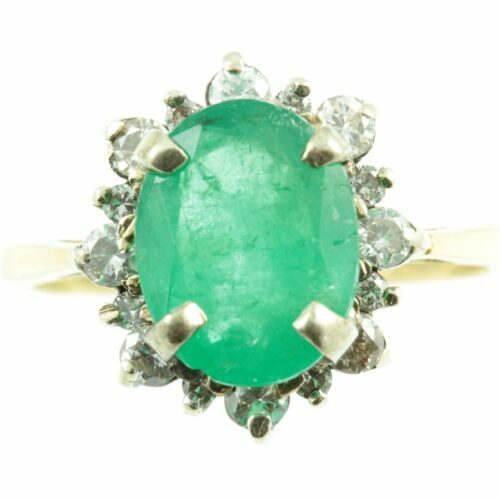 This bright and lively emerald gemstone weighing 1.57 ct is mounted using a secure claw setting. Surrounding which is 16 round cut brilliant diamonds, that have a combined weight of 0.48 ct. All of these diamonds are very evenly matched and have excellent clarity, producing a beautiful sparkle as they catch the light The diamonds are secured with claw settings and are raised up on an 18ct white gold prong setting. While the band is of made rich 18ct yellow gold, creating a beautiful contrast. A beautifully designed and very well-made ring. Ring size: UK size K, US size 5.25 this ring can be re-sized free of charge. Period: Art Deco Jewellery ( 1920 – 1935 ). An original pair of Art Deco cufflinks. 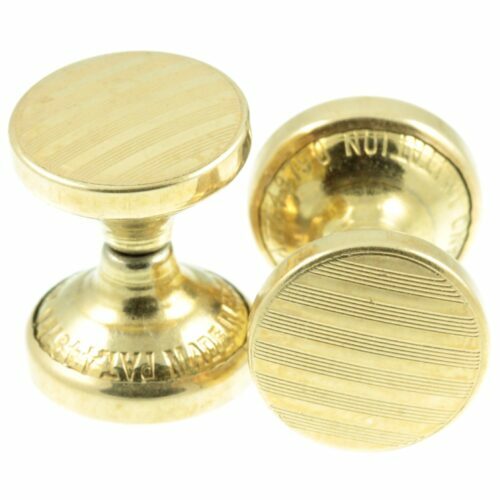 These unusual pair of 1930s double ended cufflinks are gold plated and are finished with a fine geometric pattern known as engine turning. These rare cufflinks feature a spring-loaded chain attached to each end, allowing each cufflink to extend up to 3cm. This retractable mechanism is in perfect condition in each cufflink. They are both stamped with the patent number 44970 for retractable cufflinks. 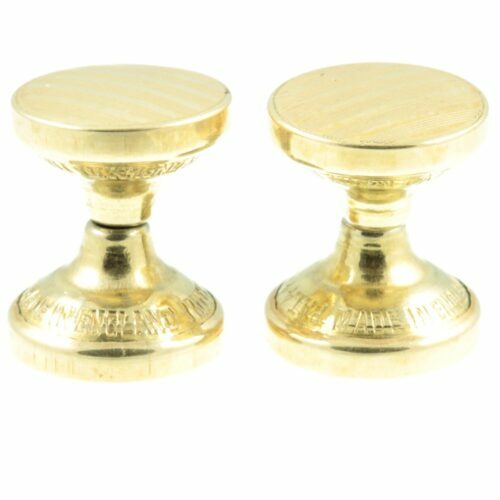 A very stylish pair of cufflinks. Size : 13mm in diameter, weight : 2.6g each. Period: Art Deco Jewellery ( 1920 – 1935 ).